Children really do say, and do, the darndest things. 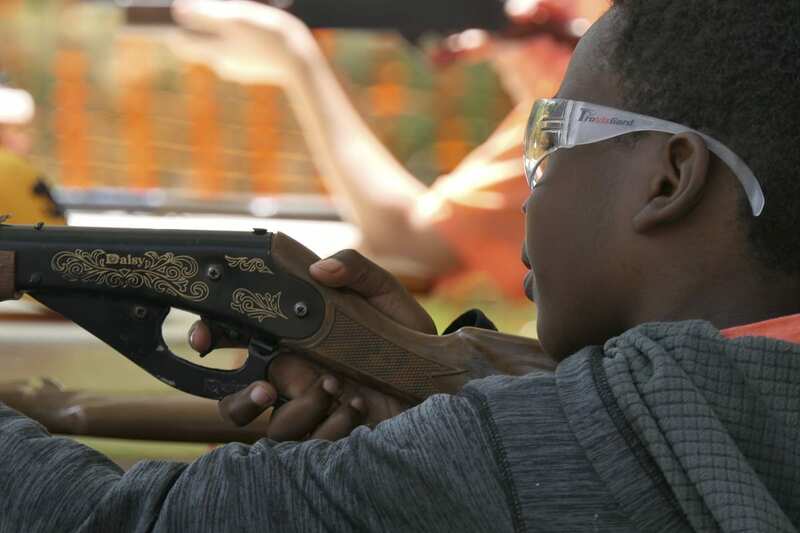 That was on full display Saturday morning as more than two dozen kids fished, shot arrows and BB guns, and got to experience something that is, unfortunately, rather rare in most of their lives. This was the third year for Trout Camp 2018, started by Dave Freund and Faith Outfitters. It began as just a small idea shortly after Faith Outfitters was founded. Freund says that led to the idea to gather up a few of those children for a Father’s Day weekend fishing trip. But as word got around, more people wanted to get involved. 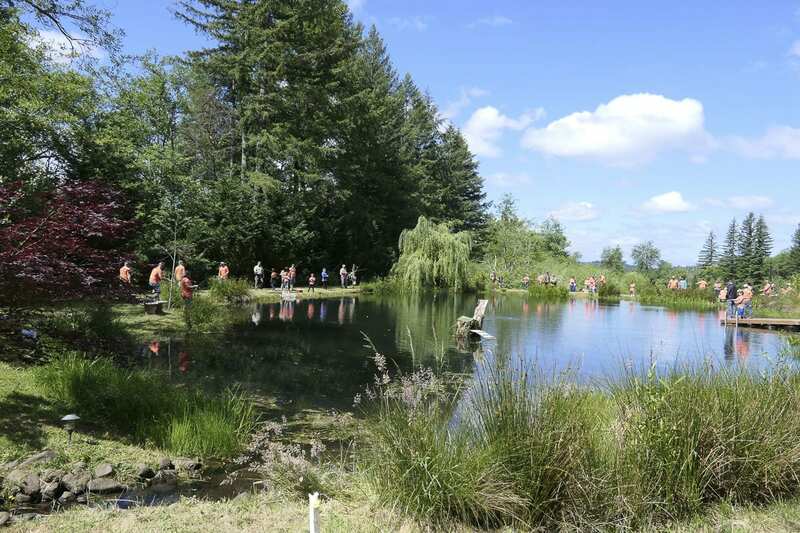 The event was eventually held on private property in Battle Ground, with Washington Department of Fish and Wildlife stocking a large pond with trout for children to catch. These days other partners have come on board. The event now includes archery, with support from Archery World, along with firearms safety instructors. This year they added free hearing and vision checks for the kids. FOX 12 TV was on hand to present Freund with their “Be the Change” award in partnership with Les Schwab tires. 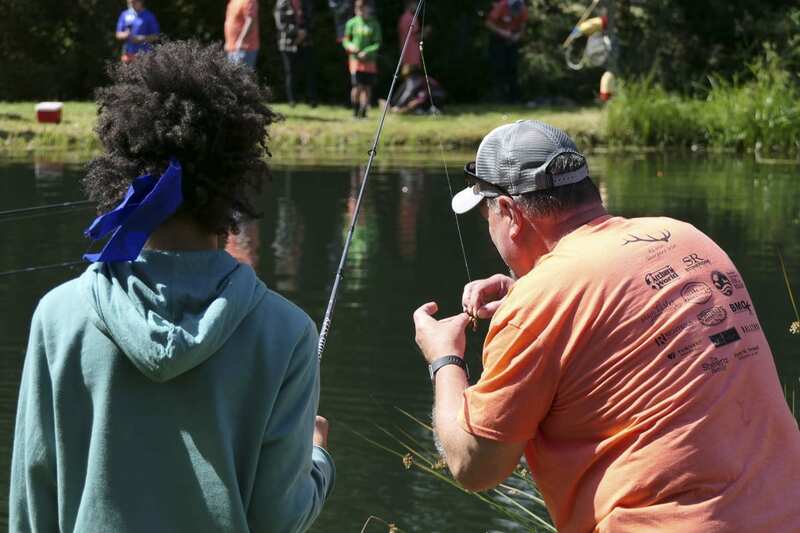 Freund says he grew up enjoying the outdoors, and hopes the kids attending Trout Camp get a chance to take away some of that connection with nature. In this case, children get to not only catch the fish, they get to help clean them, and then take them home to be eaten. While there’s nothing overtly Christian about the event, Freund says they do see it as a chance to share God’s love with the kids. He says Faith Outfitters was started as a way to connect with people who, perhaps, have become disenchanted with the modern church. The present location for Trout Camp allows for a maximum of around 35 kids. This year they had 30 signed up, along with over 40 volunteers. That means every child who attends gets assigned someone to tag along with them, and special one-on-one attention they might not often get otherwise. It was clear from the smiles on most of the faces, and the excited shouts every time someone reeled in a fish, or hit a target, that the children were enjoying it. Perhaps the adults were enjoying it even more. Former Major League Baseball player and former Union baseball coach Tom Lampkin, also a part of Faith Outfitters, noted there is also a message of faith at the camp. “We want to plant a seed that there is a God out there who loves them,” Lampkin said. “It’s a message of hope,” Freund added. Trout Camp is made possible with the help of a lot of sponsors. Aside from Archery World and WDFW, those include Real Living Real Estate Group, Sportsman’s Warehouse, Ridgefield Pioneer Marketplace, Righteous Clothing, StoneRidge Homes, Ballyhoo Print, and Bill Matthews Outdoors.